AXION Recycled Plastics Incorporation, a reprocessor of recycled plastic materials and a wholly owned subsidiary of AXION International Holdings, Inc, announced that it has commissioned an additional extrusion line to increase its manufacturing capacity. 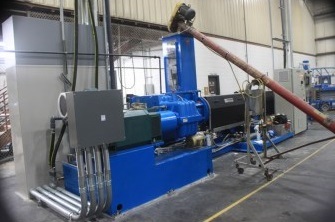 The newly commissioned equipment is a Davis Standard 6″ extruder, which began production on December 13. The installation of this extruder will add an additional 1,800,000lbs of reprocessed (pelletized recycled plastic resin) to the Company’s monthly capacity. The machine is capable of processing post-consumer and post-industrial plastic. AXION recently announced the signing of a three-year US$42,000,000 contract to provide high molecular weight (HMW) high density polyethylene (HDPE) to one of the largest thermoplastics companies in the US.